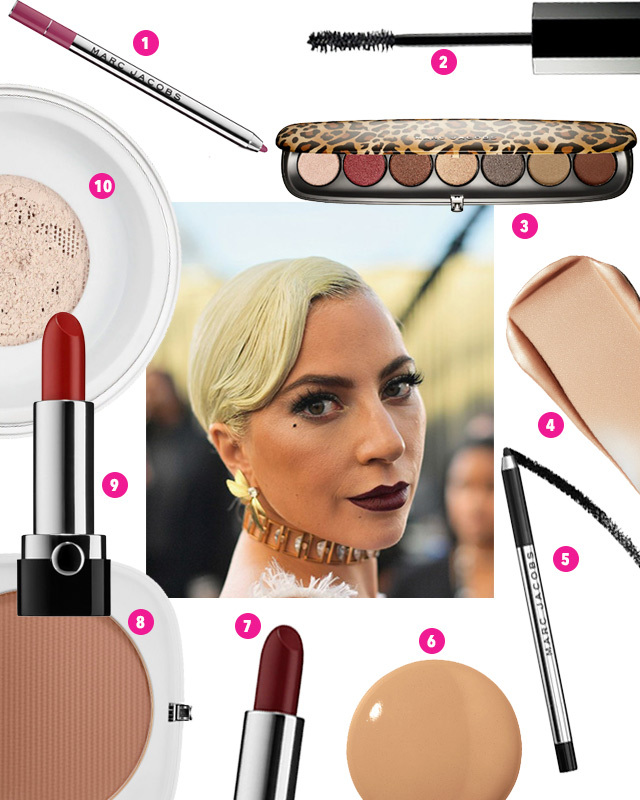 For the 2019 Screen Actors Guild Awards, makeup artist Sarah Tanno used Marc Jacobs Beauty to create Lady Gaga’s dark shimmering eyes and deep burgundy lips. For the eyes, Sarah “wanted the texture to look like a glaze.” She used the Marc Jacobs Beauty Eye-Conic Frost Multi-Finish Eyeshadow in Flamboyant (3) palette. 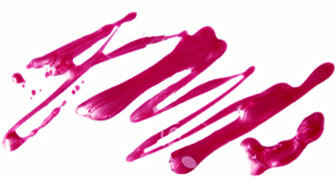 First she swept the “Eleganza” shade, a metallic deep taupe, all over the lids and under the outer corners of the eyes. Then she added the “Hey Girl Hey” shade, a metallic pinky-peach, under the brow and in the inner corners of the eyes. To emphasize the rims, Sarah lines eyes with Marc Jacobs Beauty Highliner Gel Eye Crayon in “Blacquer” (5) to tight line and blend out to a smoked liner. She finished Gaga’s eyes with a coat of Marc Jacobs Beauty Velvet Noir Major Volume Mascara (2) on the top and bottom lashes. For the lips, Sarah heavily lined the lips with Marc Jacobs Beauty Poutliner Longwear Lip Liner Pencil in “Currant Mood” (1), and then combined two shades of Marc Jacobs Beauty Le Marc Lip Crème Lipstick: “Blow” (7), an intense dark berry hue, with a pop of cherry red “Dashing” (9) just in the center of the lips. Sarah created Gaga's creamy bronzed complexion using a combination of Marc Jacobs Beauty Shameless Youthful-Look 24-H Foundation (6) and Marc Jacobs Beauty Dew Drops Coconut Gel Highlighter in Dew You? (4). Sarah set the look with Marc Jacobs Beauty Finish Line Perfecting Coconut Setting Powder (10) and gave Gaga an overall tawny tan, along with dramatic contouring using Marc Jacobs Beauty O!Mega Bronzer Coconut Perfect Tan in Tan-Tastic! (8).